There’s some great fishing happening in Fort Lauderdale right now. A little bit of everything is biting and we’re seeing some pretty nice fish hitting the docks. The strong East winds are bringing the dolphin in close, right in onto the reef. 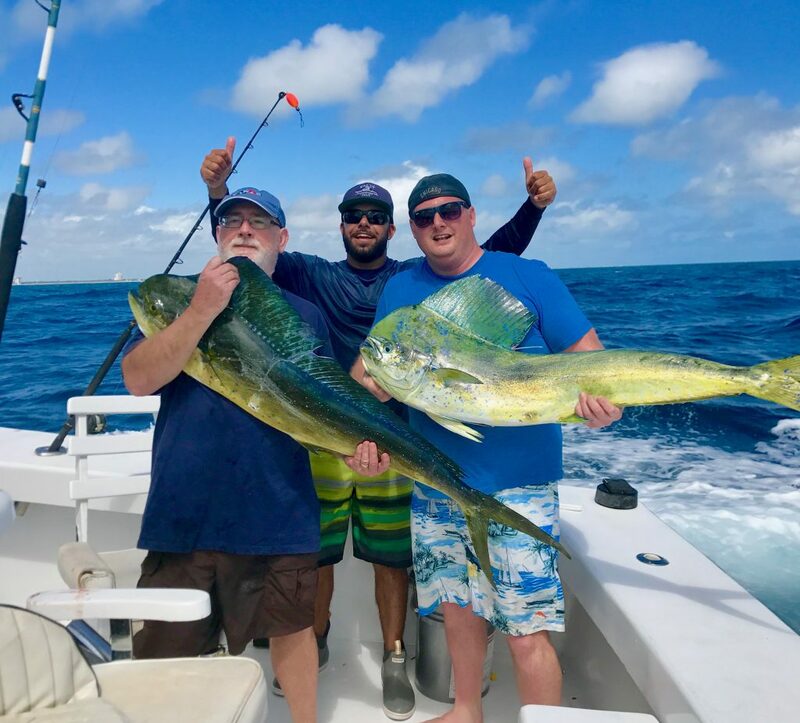 We’re catching mahi-mahi in 100-200ft of water, something that happens very rarely, usually only in March and April. They follow the seaweed lines as they get blown in closer to shore and they linger on the reefs because of the large amount of available food. A lot of the mahi are pretty big, larger than the average size ones we normally catch. Dolphin aren’t picky eaters. They will eat just about anything you are using for bait, you just need the get the baits near to them and they will gobble it up. Dolphin have voracious appetites this time of year and most of them are above average in size. We’re getting into the absolute best fishing month of the year to catch dolphin, April. 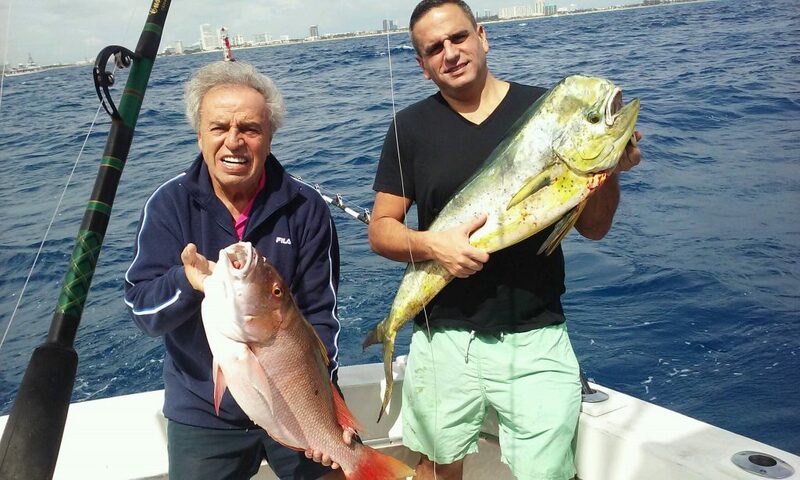 Nice dolphin fish and mutton snapper caught by these guys on a Fort Lauderdale fishing charter. Tunas, wahoo, barracuda and sailfish are also biting on the reef and edge of the Gulfstream on our fishing charters. This time of year, you can catch just about anything in 100-300ft of water. This water column holds a tremendous amount of baitfish and available food, so the fish congregate in that water column for easy pickings. Tunas have been biting great for the past few months. 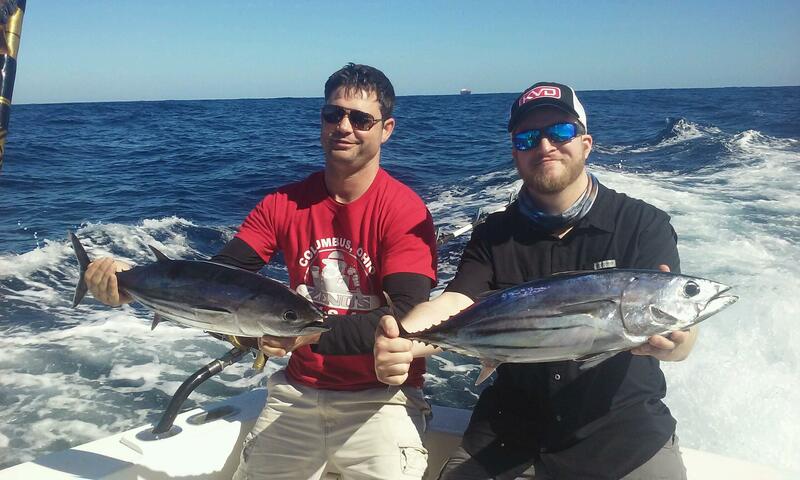 In December, we started catching all the small tunas in the 1-2 pound range. By late January they were 2-4 pounds. Now in March, they are already 5-10 pounds in size and still biting really good. There are a few really big tunas up to 30 pounds mixed in, but most of them are in the 5-10 pound range. Great sushi if you remember to bring your wasabi. Wahoo bite good on the full and new moon phases. They eat best on the big tide swings that these moon phases bring with them and we catch them smack dab on the reefs in only 100ft of water. Trolling artificial lures and rigged baits works best as you can cover a lot of territory, but slow trolling works really good for them as well. 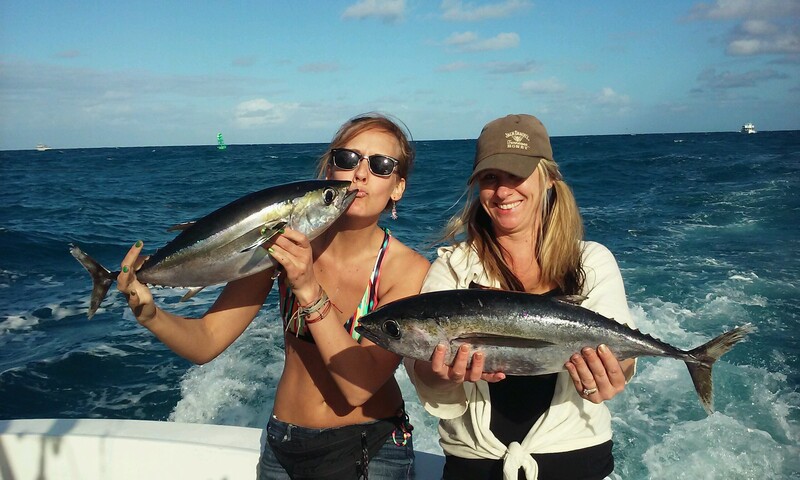 Nice tunas caught by these fisher gals while trolling the reefs of Ft Lauderdale. Sailfish and barracuda are the top predators out there right now. With no natural predators, these fish have free reign out there to hunt without the fear of being hunted in return. We catch our sailfish by either kite fishing, slow trolling live baits along the reefs or by faster trolling of artificial lures and rigged baits. Barracudas eat the same stuff. These top gamefish bite really good whenever we get a strong east wind and you’ll find them among the schools of tuna that pop up out there. Kite fishing works particularly well for them on these windy days because the baitfish put off such a strong fish-in-distress signal that can be honed in on from a great distance away. Sharks are also biting out there in big numbers (and big sizes), but I’ll save that for a future report. 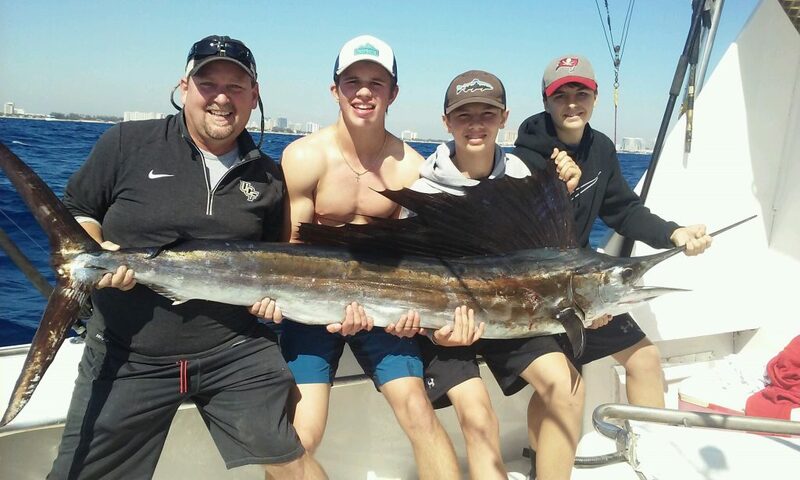 Nice sailfish caught by this family on a fishing charter during their vacation in Fort Lauderdale. And lastly, the wreck fishing is getting stronger by the day. Big fish are starting to congregate in large numbers around our shipwrecks in 200-400ft of water. For many years, Fort Lauderdale supported an artificial reef program. This program brought many old and retired ships out to these depths to be permanently sank to make a structure for fish to congregate around. The divers and fishermen loved it! It gave us both an excellent spot to come to find what we were looking for… big fish. From the months of March through May, a lot of big fish show up around these wrecks with an appetite. They are ready to eat just about anything you drop near their noses. 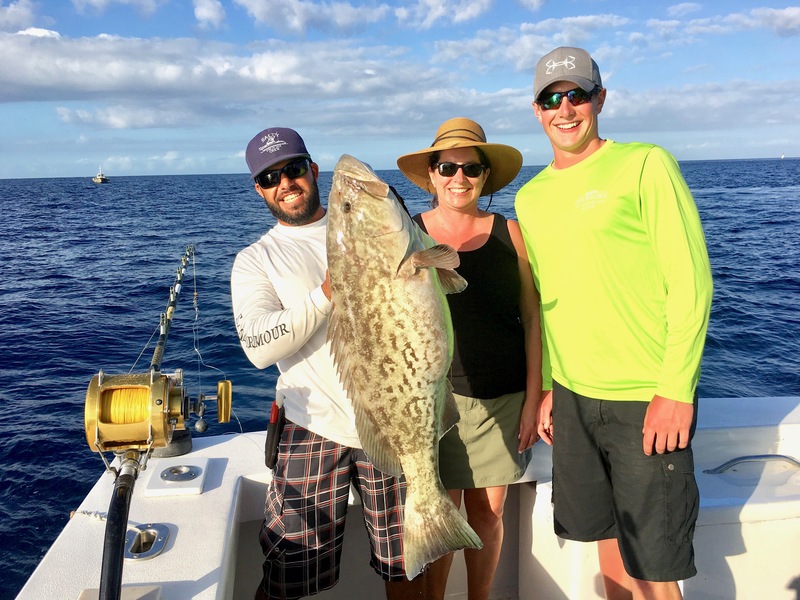 Big groupers, amberjacks, cobia, snappers and more are all caught in big numbers around our wrecks this time of year. This is the only time of year you can show up to a wreck, drop a live bait down and be hooked up to a 40-60 pound big game fish. I really, really love wreck fishing in the Spring fishing season. 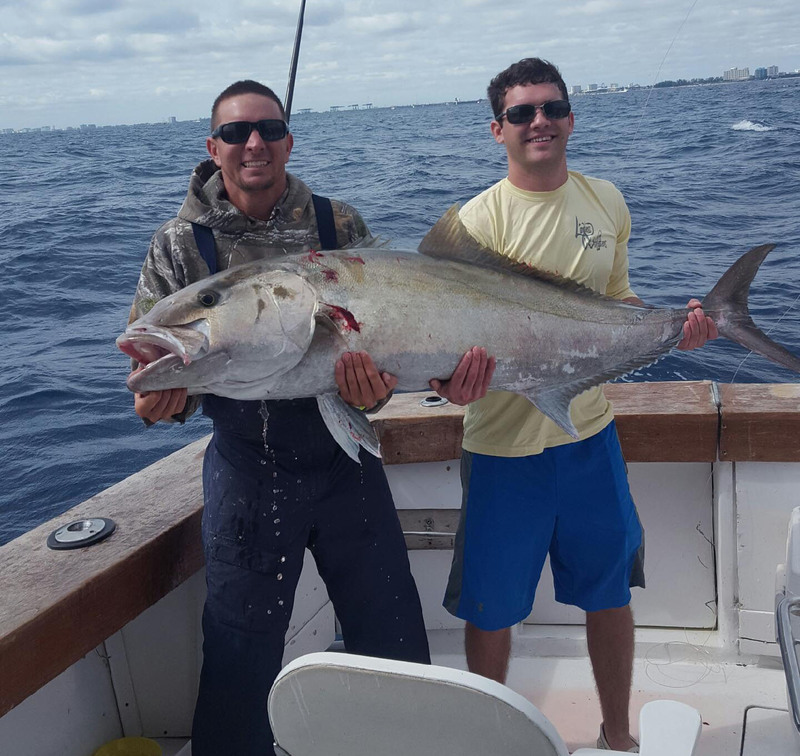 Check out this monster amberjack, caught deep dropping over a Ft Lauderdale shipwreck. Good luck to everyone fishing with us over the next few weeks. 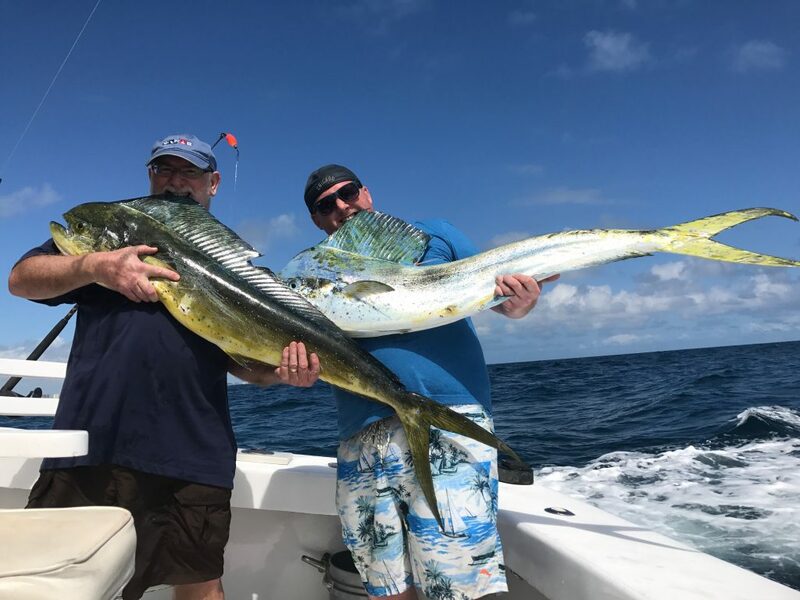 This time of year is about the best time you can come down to fish Fort Lauderdale and although we do have slow days from time to time, the average catches we have this time of year blow away the average catches throughout the rest of the year. Tight lines everyone and I’ll sea ya on the water. Big grouper caught on a shipwreck while deep dropping. 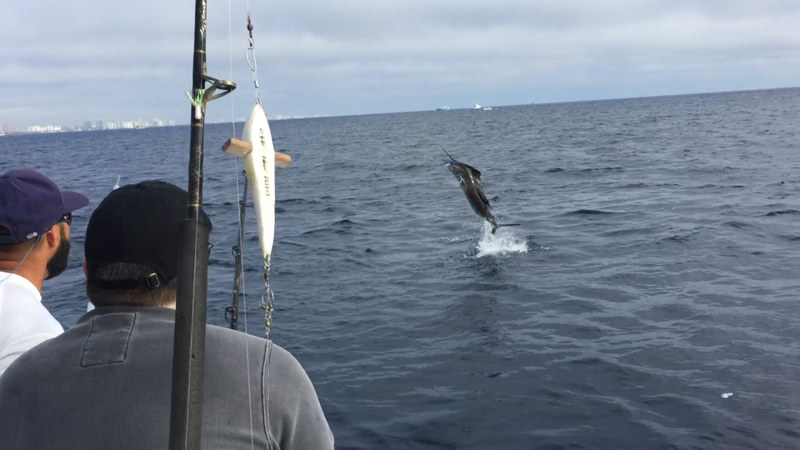 A sailfish in all it’s majesty, jumping behind the boat. This is why I love Sportfishing. 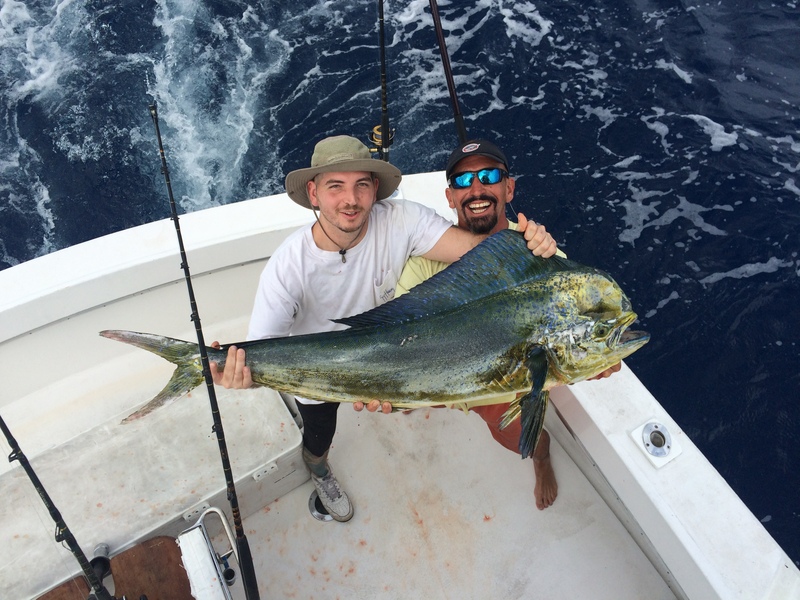 The fishing off Fort Lauderdale is awesome this month. Just about everything is biting. We’re into our best season of the year for fishing… March, April and May. These 3 months are far and away the best time of the year to fish offshore of the Fort Lauderdale coast. Tunas are everywhere, dolphins are showing up, some sailfish are biting, a random wahoo is caught here and there, big fish around the shipwrecks and the shark season is beginning. This is the time of year us Fort Lauderdale fishermen wait for. Beautiful pic a some nice dolphins caught on our sportfishing charter. Dolphin. The dolphin bite is getting good. Yesterday, we caught a pair of 20+ pounders fishing in just 300ft of water, just outside the reef. We were kite fishing and both fish came up on the kite and were fighting over the same bait. We hooked one and pitch baited the other. The dolphin come in close this time of year to spawn and some of them are really, really big. A lot of them are 20+ pounders, some of the biggest dolphin we catch all year. The strong East winds blow them in and get them chewing. The strong East winds we’re about to get this weekend is going to get them biting like mad. Dolphin LOVE a strong East wind. It makes the ocean rough… really rough, but it’s great for fishing. The general rule out of Fort Lauderdale is the worse the weather, the better the fishing. I can’t wait to do some dolphin fishing on Saturday and Sunday this weekend, I bet it goes off! Tunas. Tunas are biting all over the reefs. They are very numerous and you can catch them very easily. Just troll some small, streamline baits up and down the reefs and you’re bound to catch them. You will see the big schools of them pop up on the surface, busting minnows and other small baitfish. Sometimes the schools are so large, it’s the size of a whole football field. They spook when you get too close, so it’s best to stay along the edges of the school rather than drive right through them and drive them deep. You can fish along a school and pick off tunas from it all day long sometimes. Most of the tunas are smaller, the size of a football, but there is no size limit on them. Also, there are sometimes a few big tunas mixed into the school as well, as well as larger predator fish following the schools and picking off the slower tunas. 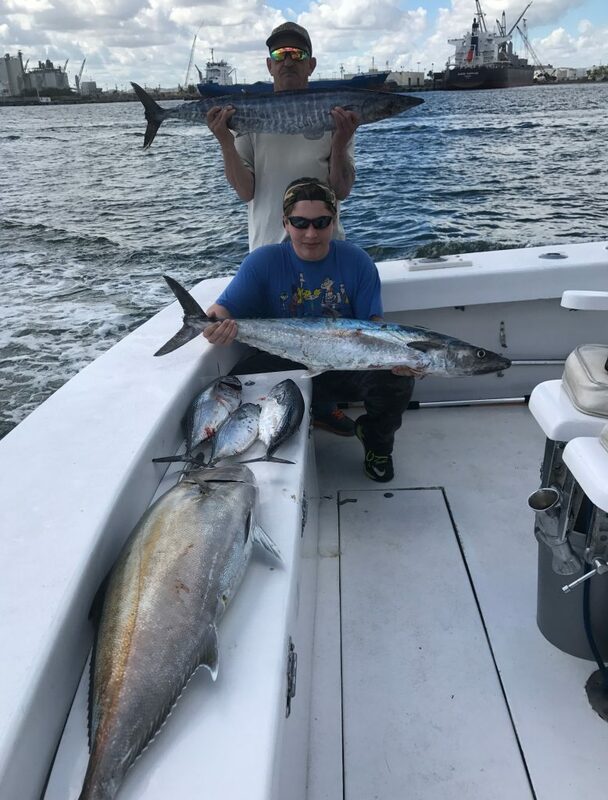 Nice catch if wahoo, kingfish and amberjack on a sportfishing charter out of Ft Lauderdale. Wahoo. Wahoo can be caught anytime you are trolling the reef in 100+ ft of water. They always bite when you least expect it. Wahoo will bite a surface or a deep bait, but most often they prefer the deeper baits on a the planers or on a deep trolling lead bait. Double hooked ballyhoo work awesome for them, as do the good ole’ trusty spoon. Dark colored sea witches work well on bright sunny days and bright colored sea witches work well on darker, cloudy days. I love to troll just in front of an approaching storm for wahoo. Something about that falling barometer that really gets them turned on. Also, the moons have a big effect on wahoo. Not so much the moons as the tides the moon creates. The full and new moons have the largest tidal changes associated with them and wahoo bite best on the outgoing tide. The like to pick off the baitfish as they are being carried outside the reef by the changing tides. It’s a smart predator move to hunt along the outside edge of the reef on the outgoing tide. Some big wahoos will be caught this month, several big ones were caught already this week. Nice sailfish just caught on our sportfishing charter in Fort Lauderdale. Sailfish. Sailfishing season is coming to an end, but last year the bite was pretty good throughout the Spring. 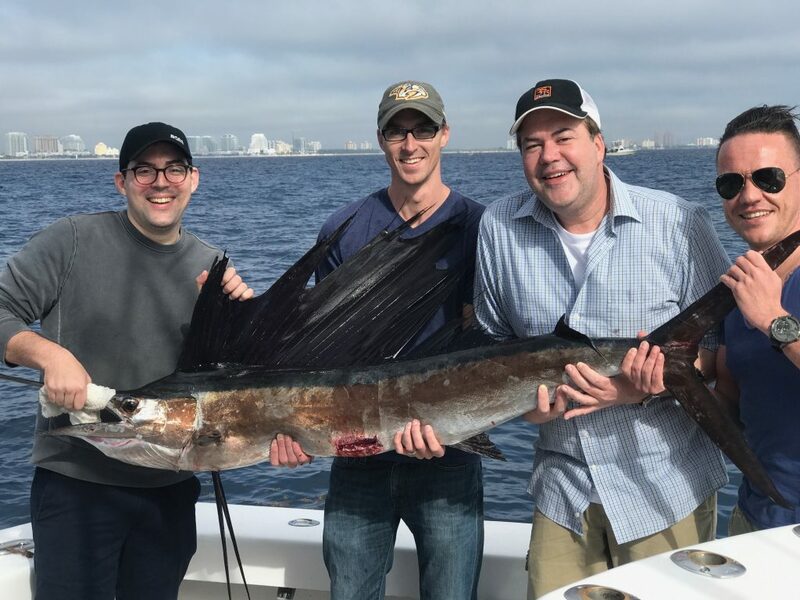 Traditionally, the winter is the best time of year to catch sailfish, but last year we had good sailfishing right into the later parts of May. Will this year be a repeat of last years good Spring sailfishing? I think it might. The sailfish bite has picked up this week with a few days of multiple sailfish caught on a single trip. I bet we catch a lot of sailfish over the course of the next couple months. The fishing is changing in Fort Lauderdale and every year is a little different than the last. Fish are early or sometimes hang late. The migrations, although they tend to follow the same patterns year after year, sometimes change a little from year to year. I think the sailfish bite is late this year, like it was last year. We’ll have to wait to see, but expect to see some nice sailfish pics in the weeks to come. Big amberjack caught deep dropping on wreck. Bottom fish. The wreck fishing goes off this time of year. There are groupers, amberjacks, cobia, barracuda and sharks hanging around the wrecks. Why? Because that’s where the easy meals are. Wrecks hold baitfish and small game fish. They congregate around the wrecks because they eat the corals, algae and minnows that grow on these shipwrecks. Larger predator fish will naturally come to congregate here too because of the food supply. It’s all about the food. Shipwrecks provide a start-of-the-food-chain effect and become an oasis of activity in the Spring months. Amberjacks really make their presence known this time of year as they are very aggressive. 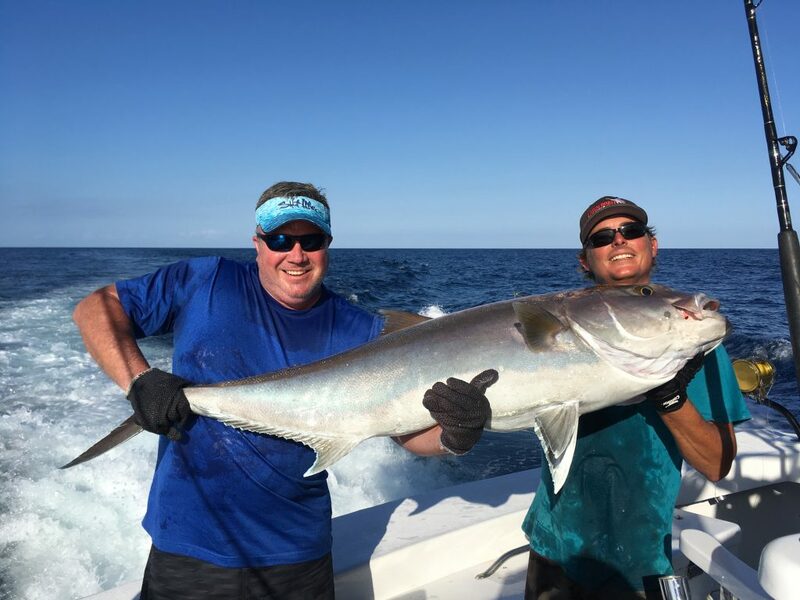 Sometimes the amberjacks are biting so good around the wrecks that you can hardly get a bait to the bottom. It gets eaten as you are dropping it down. Groupers are down there too, if you can get the bait past the amberjacks. Groupers unfortunately are out of season. They are awesome to catch but you have to throw them back. Good stock until May, when the season opens on May 1. I’m going to be killing me some groupers in May! Cobia, barracuda and sharks also patrol the wrecks, although in lesser numbers. You never know what you may hook into when fishing live baits around these shipwrecks. It’s the best technique for quick action on big fish. 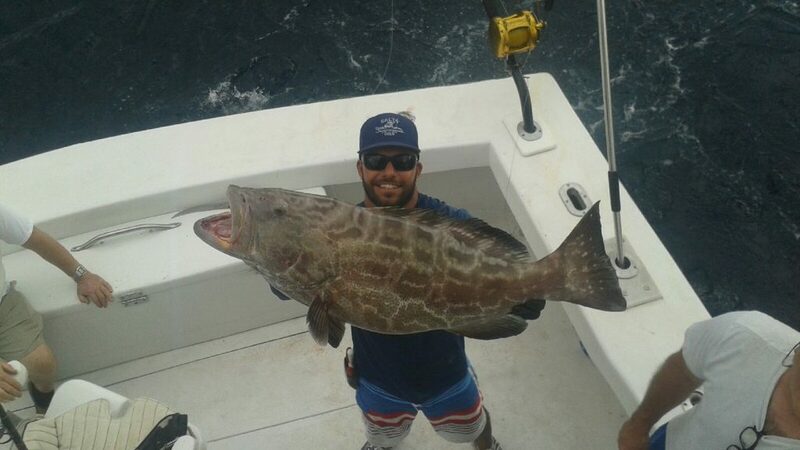 Big grouper caught deep dropping over a shipwreck in Fort Lauderdale. And that’s why I LOVE fishing Fort Lauderdale in Spring. Good luck to everyone fishing over the next few weeks. We’re about to get a strong East wind blowing this weekend which should light up the fishing for us. I bet there are some big fish caught over the next week, prizes for the anglers who brave the rough seas. Don’t let the rough waters scare you. All the best fish are caught when it’s choppy. Tight Lines and I’ll sea ya on the water! These guys tried to eat their dolphin before we got in from the trip.